Data is information collected during research. Data can be analyzed, interpreted, and/or evaluated using statistical, mathematical, and other procedures to answer research questions. This is an example of raw data within an Excel spreadsheet. Analysis, interpretation, and/or evaluation hasn't occurred. Headings and cells may be difficult to understand without more detail regarding the research. Data Source: Social Explorer Tables: ACS 2015 (5-Year Estimates) (SE), ACS 2015 (5-Year Estimates), Social Explorer, U.S. Census Bureau. Statistics are data that have been analyzed, interpreted, and/or evaluated. Statistics are often presented in aggregate form and visualized in tables, charts, maps, graphs, etc. This is an example of statistics presented in a bar graph. Analysis, interpretation, and/or evaluation has occurred. The information (data) is summarized and visualized. Source: Barthel, M., Mitchell, A. & Holcomb, J. (2016). 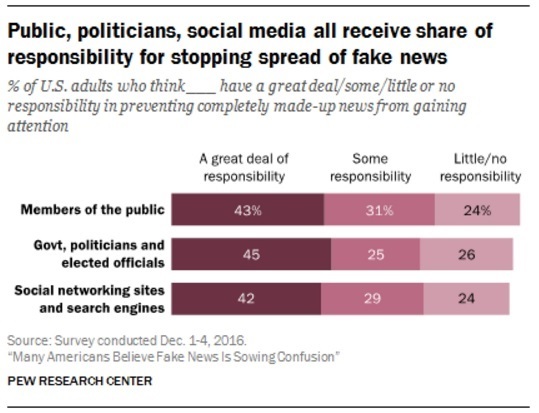 Many Americans Believe Fake News is Sowing Confusion. Pew Research Center. ASK YOURSELF: Is this source SMART? Determine if your data/statistics are SMART before believing what is reported. Source: Who or what is the source? Can you trace the data back to the original source? The data source and the reporter/citer/publisher are not always the same (e.g. advocacy organizations often publish data that were produced by some other organization). What are the credentials of the original source? If the source is unclear, be skeptical about the data/statistics. Make sure it's a source you can trust - e.g. Pew Research Center. Motive: Why do they say so? What was the purpose of the collection or study? Who was the intended audience for or users of the data/statistics? Was it collected as part of the mission of an organization, for advocacy, or for business purposes? Do they have a special interest or particular point of view that may cause them to slant data/statistics to suit their beliefs or causes? Biased sources can be accurate, but you need to check them carefully. Authority: Who produced the data/statistics? What are the author's/data producer's credentials? How widely known or cited is the producer? Is the producer an expert on the subject? Review: Go over the collection methods & completeness carefully. What methodology was used? Is the methodology documented? How are the data collected - count, measurement, or estimation? What was the total population? How does that compare to the size of the population it is supposed to represent? What methods were used to select the population included? How was the population sampled? What populations were included and/or excluded? Are there any notable errors in facts or conclusions? Is the information current enough? Remember that there is often a delay between data collection and data reporting because analysis and publication take time. Two-source Test: Double check everything if possible. Research the subject in journal articles and newspapers, by interviewing others, and search online. Does your two-source test confirm or contradict the data/statistics? Read Data & Statistic visualizations carefully. Read charts, tables, and infographics carefully. What do the numbers, percentages and averages represent? Are the x and y axes labeled at an appropriate scale for the data? Are the distances between each point on the axis equal? Does the y-axis start at zero? Look at the numbers. Don't take the visualization at face value. Consider the two infographic examples at the bottom of this guide. For more info, read Infographics Lie. Here's how to spot the B.S. Jylisa Doney and Alicia Kubas' Finding Data & Statistics research guide at North Dakota State University (Accessed March 13, 2017). Laurence McKinley Gould Library's Data, Datasets, and Statistical Resources research guide at Carleton College (Accessed March 13, 2017). ASK YOURSELF: Is this Infographic SMART? It is unclear who collected the data. It could be ThinkProgress, but we cannot know for sure. The data in the graph is not cited to an original data source. Who collected the data? The ThinkProgress organization thinks that Obamacare (the ACA) has made positive changes on the health care system. The subheading - What has already changed for the better, and what Republicans want to repeal - accuses Republicans of wanting to repeal the positive changes listed in the infographic. They do not cite evidence to support this claim. 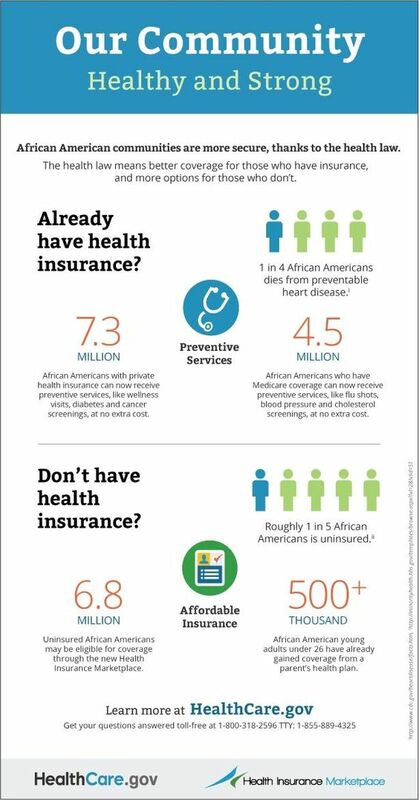 The infographic was produced to advocate for Obamacare. "ThinkProgress is a news site dedicated to providing our readers with rigorous reporting and analysis from a progressive perspective. They could be slanting the statistics to support their "progressive perspective." We do not know because they do not cite the source of their stats. We do not know who originally produced the statistics. It could be ThinkProgress, but we do not know for sure. It is impossible to know from the infographic how the data was collected. ThinkProgress makes sweeping statements with no explanation. The graphs are deceptive. For e.g., the person shapes are layered onto the map of the U.S. for impact and graphic visualization purposes. The number of person shapes on the graph do not reflect the 54 million statistic. 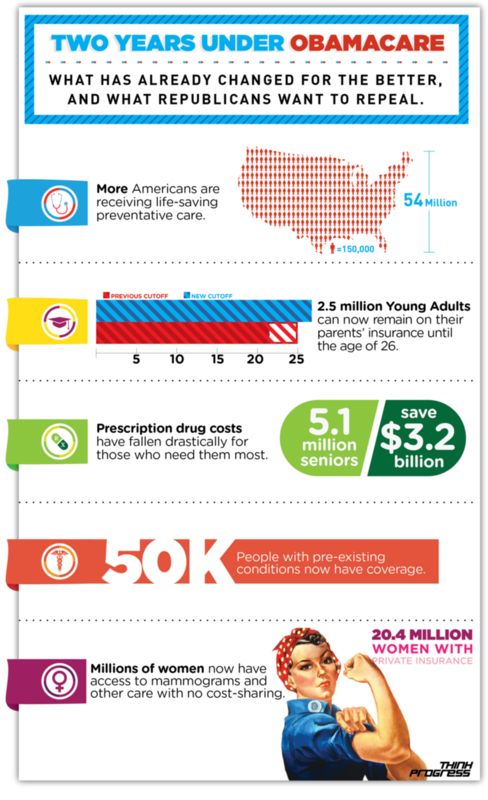 The title of the infographic - Two Years Under Obamacare - dates the data. At this point it would be better to find more current data that analyzes the impact of Obamacare over a longer time period. The statistics presented in this infographic was collected from a variety of sources including the Commonwealth Fund, Department of Health and Human Services, Guttmacher Institute, Hart Research Associates, and the Kaiser Family Foundation. Planned Parenthood cites all of statistics published in the infographic making it possible to trace the stats back to the original sources. The credentials of the original sources can be easily identified on the About Us section of each source's website. Many people trust these sources; however, there are likely people and organizations that do not. The purpose of Planned Parenthood's infographic is to show that the Affordable Care Act is working for many women. It was created to support the mission of Planned Parenthood - providing healthcare to women. They have a special interest in people agreeing that the ACA is working. They want the ACA to continue so that women, especially low-income women, continue to have health insurance and seek medical care. Planned Parenthood, Commonwealth Fund, Department of Health and Human Services, Guttmacher Institute, Hart Research Associates, and the Kaiser Family Foundation have all been involved in health care, research, and/or advocacy for many years. Each organization is widely known and/or cited in news, scholarly literature, and policy debates. While many people distrust Planned Parenthood, the organization is merely the creator and publisher of the infographic. All of the statistics can be traced to original, more trusted organizations. This infographic includes statistics collected from a variety of sources in a variety of ways. The Kaiser Family Foundation analyzes statistics from the Current Population Survey by the U.S. Census. The Guttmacher Institute analyzes data from federal policy documents. The Commonwealth Fund collected its' own data through surveys. While some of the statistics presented in the infographic are a bit old (e.g. 2007), the original sources have updated their publications. Do a Google search for the name of the document cited and you may find a more recent edition (e.g. Women's Health Coverage Since the ACA: Improvements for Most, but Insurer Exclusions Put Many at Risk). The content is presented in a clear and logical timeline. The graphs accurately reflect the information given.